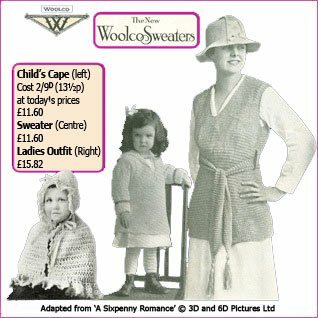 Woolworth started its century in the British High Street selling paper patterns for sixpence, along with everything people needed to make the clothes from its haberdashery counter. Millions of mums lovingly made things for their children to wear, and experimented with finishing touches to up-cycle their own clothes. The High Street stores were a life-saver for cash-strapped families, particularly when they got hold of suppliers' surplus stocks of posh items like silk knickers and put them on sale for sixpence a pair. After World War II, no longer tied down by fixed prices, the chain tried to get people of all ages to buy a broader range of fashions from its stores. But, despite some early success, canny shoppers soon found that, despite the low prices, bright colours and catwalk looks, many of the garments weren't good value if they were uncomfortable and didn't last well. The perception proved hard to break until new owners struck on a winning formula. Instead of trying to dress everyone, they would concentrate on children's clothes and do them really well. They licenced the popular Ladybird brand, stuck rigidly to its guiding principles about quality and style, and dropped the prices to make the range available to everyone. The move, backed by a no-quibble money-back guarantee, quickly took them to the number one spot, as Britain's favourite clothes shop for the under-fives, attracting millions of shoppers, who remained loyal until its last day in the High Street. Woolworth stores sold fashions throughout their century in the High Street. But the items sold before the World War II were very different from the stylish Ladybird clothing of more recent times. Our Fashion and Ladybird Gallery explores how tastes and lifestyles changed over the century, drawing on an archive of photographs, advertisements and reminiscences. When the first British store opened in Liverpool in 1909, the world was a very different place. Many more mums made clothes for themselves and their children, rather than buying made-up garments. Woolies sold everything that was needed to get started. The Haberdashery department stocked paper patterns which were kind of 'join the dots' guides to making clothes. It also carried wool, cotton and ribbons, as well as needles and pins of all shapes and sizes, scissors and tape measures. The highest price for anything was sixpence, the equivalent of 2½p at the time or £2.11 today, but many Haberdashery items was just one old penny, and were known as 'penny notions'. 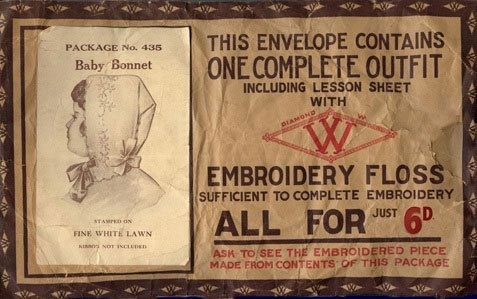 For beginners there were sixpenny starter packs with everything needed to make a simple garment. This baby's bonnet was one of the first items. The pack contained cloth, needles and thread. Customers could buy the ribbons separately, if required. Twelve years after the first pack was sold, they were still popular in the hundredth store at Mansfield. Making clothes was a popular winter pastime for women of all ages. Most worked under gas light, before homes had electricity, let alone TV. Most girls were taught dressmaking and basic mending at school, where it was considered a key life skill, that could also save them money. Before World War II the stores also offered an ever-changing selection of made-up garments at bargain prices. To supplement regular ranges of stockings and socks, the Buyers sought out manufacturers' surplus and seconds, which they were able to sell cheaply. Silk knickers were a favourite sixpenny line; signs in the stores claimed that they were surplus from 'Regent Street Fashion Houses', rather than the Lancashire factories that made them. In the Thirties there was a craze for 'Vanity Veilings'. At the time women rarely ventured out without a hat. 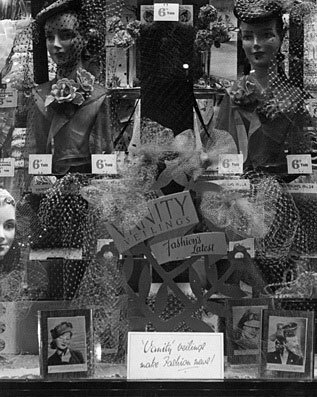 The veilings provided a cheap way to spruce up old headwear, and were so popular that they were regularly displayed in the windows like these ones, captioned 'Fashion's Latest Vanity Veilings' from 1935. Escalating prices after the outbreak of World War II forced the High Street chain to drop its sixpenny price maximum, opening the door for a wider fashion range. Between 1950 and 1980 the Buyers worked hard to establish a cheap but stylish family clothing offer with mass-market appeal. Patterns enjoyed a renaissance after World War II. Clothing remained rationed until 1953, inspiring a new generation of seamstresses and knitters to make their own outfits, recycling material from hand-me-down garments. They showed great ingenuity with their needles! 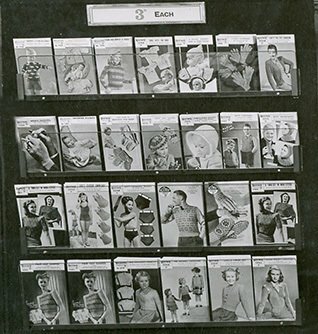 Woolworth kept its patterns up-to-date, targeting younger shoppers with eye-catching wall displays, which included full-colour photos of people modelling the finished garments. A smart front cover made the patterns much more likely to sell, so every effort was made to find photogenic models, who were often asked to act out a scene from a popular movie at the shoot. On a nearby counter Penguin books had trebled in price to 1 shilling and sixpence between 1940 and 1950. The Haberdashery Buyer actually dropped the price of his patterns, selling them for just threepence (1¼p). He knew that if people bought a pattern, they normally bought the wool, cotton and needles it required to go with it. Woolworth's relationship with Ladybird started in the 1930s, when the manufacturers, Pasolds, showed samples from their new factory in Langley, Buckinghamshire. 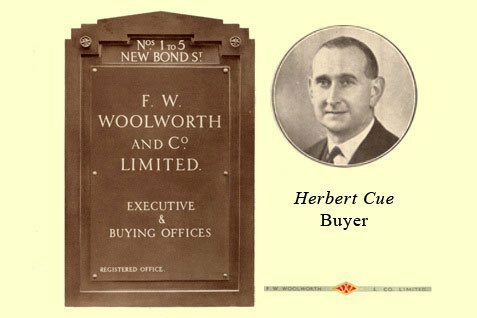 The Buyer, Herbert Cue, liked what he saw. He paid a little extra for a large opening order. The companies went on to enjoy a cordial relationship for the next sixty years, until the store bought the Ladybird brand name outright just before the millennium. However, in keeping with its policy, until the 1980s Woolworth sold under its own name, rather than using the Ladybird name. You can see pictures of some of the Fifties and Sixties displays later in our Fashion Gallery. The stores were remodelled after the chain changed hands in 1982. The new owners dropped adult clothing so that they could concentrate on kids fashions, starting with babies and toddlers. Executives amazed the City when they revealed that they had exclusively licenced the respected Ladybird brand, and would carry the clothes in every store. The brand owner, Coats Viyella, helped with design and advised on quality control and supplier selection. The tie-up fulfilled a life ambition for the Pasold family, which had dreamt of Woolworth applying its mass-market knowledge to make its beautiful fashions affordable for everyone..
Our Fashion Gallery includes pictures of the first test store for Ladybird at Reading, Berkshire, and takes the story right to the present day, now that Ladybird is a brand of Shop Direct Group Ltd. and is available through its popular very.co.uk website and from Littlewoods. They are continuing a tradition that started more than 400 years ago and is still going strong today!